Will the Dow crack 17,000 this week? Wall Street is on the cusp of another milestone. The Dow Jones industrial average is about 50 points away from crossing 17,000 for the first time ever. The blue-chip average closed at a record high Friday, as did the broader S&P 500 index. The Dow index of 30 of the biggest and best known U.S. brands has been breaking through these "psychologically important" milestones with remarkable speed. It's considered a good gauge of the health of corporate America. If the Dow crosses 17,000 this week, it will be less than six months after it first crossed 16,000. It rose above 15,000 for the first time just over a year ago. In 2007, the Dow went from 13,000 to 14,000 in about four months. But it wasn't always this way. It took about seven years for the Dow to plow through 12,000. When the Dow rose to 10,000 for the first time in 1999, floor traders broke out commemorative baseball caps to mark the occasion. Most analysts say the round numbers are not technically important, but they are a good indication of the current mood among investors. Stocks have been in a bull market for more than five years, and the bulls don't seem ready to throw in the towel any time soon. 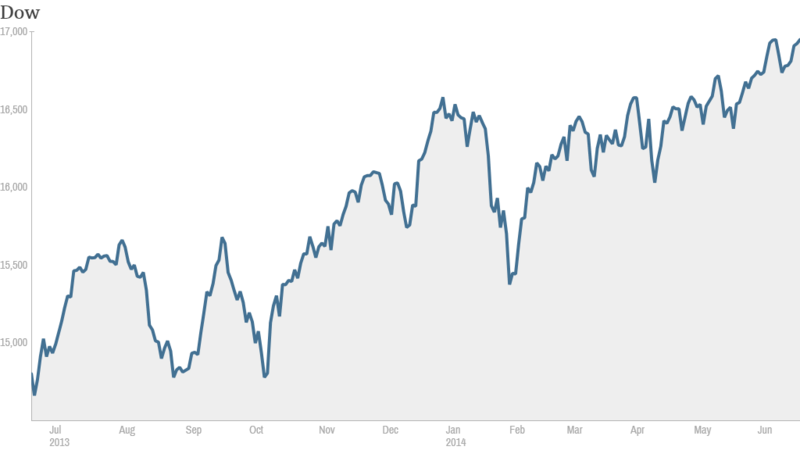 CNNMoney's Fear & Greed index is at a level indicating that investors are feeling extremely greedy. The index stood at 95 out of 100 on Friday. With greed driving the market, fear seems to have vanished. The market's so-called "fear gauge," the VIX (VIX), is at the lowest levels since 2007. Some are starting to say that investors are complacent. Stocks jumped Wednesday after Federal Reserve chief Janet Yellen reiterated that the central bank is unlikely to hike interest rates in the near future. The Fed's policies, along with a gradually improving economic backdrop, have powered the bull market thus far. Investors seem confident that this fortuitous combination will remain in place for a while longer. But there are some mixed signals below the surface. The top performing Dow stock this year is Caterpillar (CAT), which is up 20% since January. That suggests investors are optimistic about the global economy, since the heavy equipment maker sells products used to construct buildings and infrastructure around the world. But banks and consumer-oriented companies are among the worst performers on the Dow this year. Visa (V) is down nearly 6% since January, making it the worst performer in the index. Goldman Sachs (GS) and JPMorgan (JPM) are also down year-to-date. Bank stocks have had a strong run over the past few years, so it's not surprising to see them underperform. But a healthy banking sector is usually considered a prerequisite for a robust economic recovery. Wal-Mart (WMT)and Nike (NKE) are also bringing up the rear on the Dow. That suggests investors don't have much confidence in the outlook for consumer spending.